Some of the most complex situations in our lives are our relationships with other people. Whether it be with your family, friends or colleagues; relationships can be difficult. It'a hard to find good people who have our best interest at heart. We all know someone who can make us feel like sunshine. The one who is there for you no matter what. Who understands that life can be hard and offers extra love. The one who is cheering you on always. Who is always down for your crazy schemes. The one who forgives you when you are not at your best. Who can make you laugh even when you are down. When you find these people do not let them go. It is so important for us to surround ourselves with people who make us feel good. When you feel good you are going to do good. Remember, to have a friend you need to be a friend. 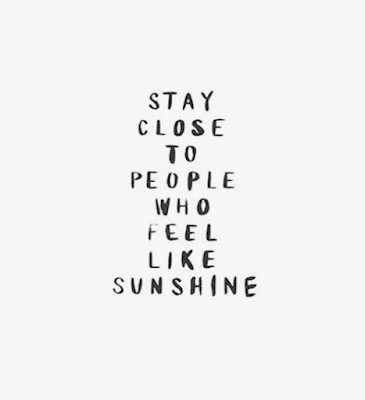 It's important to make other's feel like sunshine too. Cheer them on, go along with their crazy ideas, let them know they are loved and appreciated. We all have a million things to do each day but taking a minute out of your day to keep a relationship strong will be worth it in the long run. Having a community who will help you grow is one of the most necessary tools in life. We can't do everything alone. How can you strengthen a relationship this week?